A strong, beautiful, and classic Sparkman & Stephens sailing yacht, Sea Angel is a unique world cruiser. Sea Angel (Sparkman & Stephens design number 2455), built at Stephens Marine in California, was one of the groundbreaking motorsailer ketches designed in the 1980's. 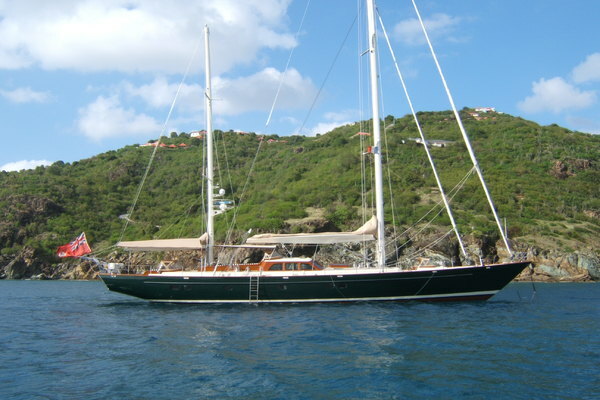 With accommodations for 6 - 8 owners and guests, and 4 - 6 crew, she can handle a large family and many guests with ease. In recent months, her systems have been thoroughly checked, cosmetics upgraded, and equipment rebuilt or replaced - all in an effort to prepare her for her new owner. She is ready to leave on her next adventure! Photos taken November 2017. Additional photos available upon request. United Yacht Sales New Jersey would love to guide you through a personal showing of this 88' Stephens Deck Saloon 1986. This yacht for sale is located in Ft. Lauderdale, Florida and priced at $695,000. For a showing please contact us by filling out the form on this page and we will get back to you shortly! “Sea Angel” boasts an engine room with 5’ 3” headroom and walk-around access to the main engine and all equipment. The main engine is a Mercedes OM 422W diesel with approximately 5,000 hours since rebuild. She has a range (under power alone) of over 2000 nm. Her maximum rpms are about 2700, and the owner cruises her usually at about 1400 rpm. For maximum safety and seaworthiness, “Sea Angel” has only 2 thru-hulls. Both are located in the engine room and all raw water needs are fed from these.